Rooftops are evolving beyond the functional. Now they’re popular spaces to entertain, enjoy nature, or lounge under the stars with a glass of wine. While most commonly found atop urban dwellings, rooftop decks are becoming popular for suburban homes, too. A rooftop deck above a garage allows homeowners to create an outdoor getaway while staying within the footprint of their home. Here are seven of our favorite ideas to consider to take your rooftop deck to the next level. When the sun goes down, rooftops can be magical places. Strands of bistro lights intertwined around railings are popular because they add just the right amount of sparkle. For a more elegant look, illuminate your deck with a few strategically placed decorative lanterns or candle displays. When it comes to rooftop furnishing, flowers and plants are a must. Sun-tolerant flowers in fun planters add bold pops of color. Climbing plants on a trellis imbue an urban or suburban space with a more natural aesthetic. Larger containers filled with lush foliage are great for rooftop perimeters. For inspiration, check out Amazing Roof Decks to Copy from Better Homes and Gardens. A rooftop presents the perfect opportunity to have a little fun. Built-in hammocks, swing beds, or large cushy lounge chairs stand out as whimsical seating trends. Combine one of those with a few practical choices, such as storage benches or cubes that can double as chairs or tables, and you’ve got an entertaining-worthy setting. Rooftops are being enjoyed nearly year-round. With autumn here, outfit your deck with a few cozy throws, a heat lamp, or even a fire pit. And don’t forget to add a seasonal cocktail to your repertoire. For some ideas, check out Esquire’s 6 Best Cocktails to Serve this Fall. More and more contractors and homeowners are choosing synthetic woods, like TimberTech’s capped composite for rooftop decks. The reason? Synthetic boards are engineered to withstand heat and moisture, so they don’t fade, splinter, warp, or split. They’re much lighter than natural wood too. For the most ambitious homeowner, a rooftop deck is the place for an over-the-top, at-home getaway. Some even convert theirs into lavish personal resorts complete with pools and a sky bar. Check out these dreamy escapes at HGTV’s Views From the Top: 21 Fabulous Rooftop Decks. One can always dream! 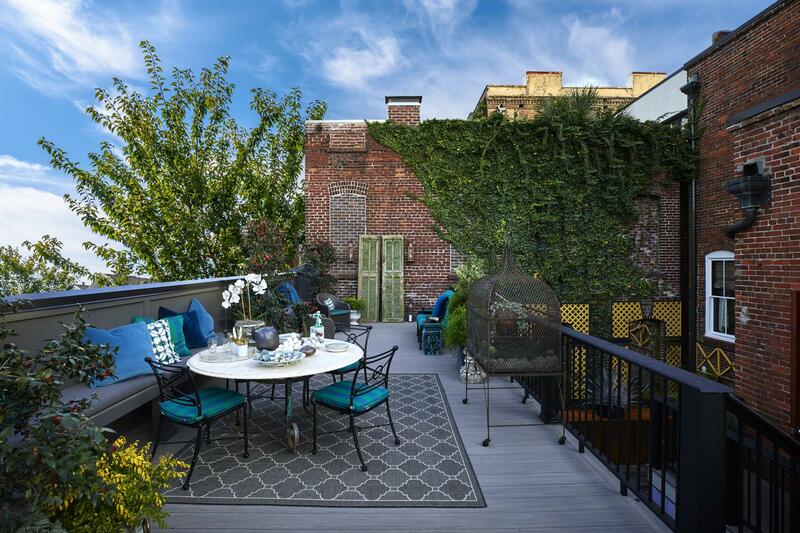 Rooftop spaces invite the homeowner to express their own style and entertaining sensibilities. AZEK building materials create the perfect foundation for any rooftop retreat. For example, low-maintenance boards give you more time to sit back and relax on your stunning new rooftop. To see for yourself, order a sample and we’ll ship it to your door for free.